The technology could be particularly useful for situations when the ball is blocked from view, such as goal-line rushing attempts when the ball carrier is often buried at the bottom of a pile of players. The technology could also be useful for tracking the forward progress of the ball, or for helping viewers follow the ball during games with low visibility – such as games played during heavy snow. See the videos below that demonstrate the system in action. Research publications can be found at the bottom of this page. Magneto-Track System: Visualization of football location for three different plays. D. Arumugam, J. Griffin, D. Stancil and D. S. Ricketts, “Three-Dimensional Position and Orientation Measurements using Magnetoquasistatic Fields and Complex Image Theory,” Antennas and Propagation Magazine, IEEE, April. 2014. Arumugam, D.D. ; Ricketts, D.S., “Passive Magnetoquasistatic Position Measurement Using Coupled Magnetic Resonances,” Antennas and Wireless Propagation Letters, IEEE , vol.12, no., pp.539,542, Apr. 2013. Arumugam, D.D. ; Sibley, M.; Griffin, J.D. ; Stancil, D.D. 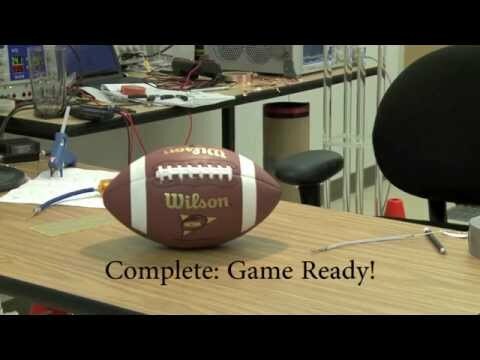 ; Ricketts, D.S., “An active position sensing tag for sports visualization in American football,” RFID (RFID), 2013 IEEE International Conference on , vol., no., pp.96,103, April 30 2013. Arumugam, J. Griffin, D. Stancil and D. S. Ricketts, “Error Reduction in Magnetoquasistatic Positioning Using Orthogonal Emitter Measurements,” Antennas and Wireless Propagation Letters, IEEE, vol. 11, 2012. D. Arumugam, J. Griffin, D. Stancil and D. S. Ricketts, “Experimental study on the effects of groups of people on magnetoquasistatic positioning accuracy,” IEEE Int. Symp. on Antennas & Propagation, Jun. 2012. D. Arumugam, J. Griffin, D. Stancil and D. S. Ricketts, “A wireless orientation sensor using magnetoquasistatic fields and complex image theory,” IEEE Radio and Wireless Symposium, Jan. 2012. D. Arumugam, D. Stancil and D. S. Ricketts, “Proximity and Orientation Sensing Using Magnetoquasistatic Fields and Complex Image Theory” IEEE Vehicular Technology Conf., Sept. 2011. D. Arumugam, J. Griffin, D. Stancil and D. S. Ricketts, “2-Dimensional Position Measurement using Magnetoquasistatic Fields,” Int. Conf. on Electromagnetics in Advanced Applications, IEEE, Sept. 2011. D. Arumugam, J. Griffin, D. Stancil and D. S. Ricketts, “Higher Order Loop Corrections for Short Range Magnetoquasistatic Position Tracking,” IEEE Int. Symp. on Antennas & Propagation, Jun. 2011.